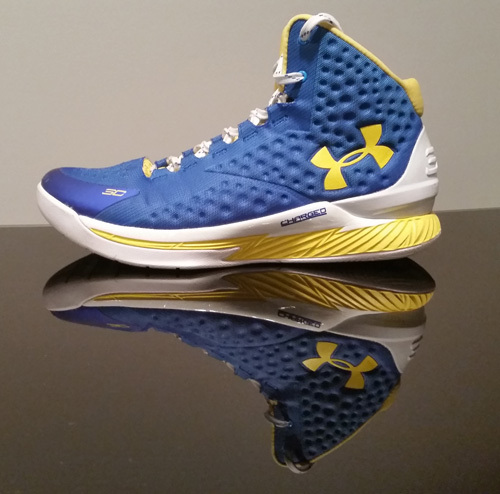 No disrespect to Brandon Jennings and the Bloodline Under Armour models of years past, but the Curry One was likely the most anticipated and most marketed UA hoops shoe since the company broke into the basketball shoe market. Curry is the hottest name and best player on the NBA’s best team, and populates Sportscenter almost daily with an array of pull up threes, slick ballhandling and Steve Nash-ian court vision. In other words, it was time for Under Armour to capitalize. Behind a slick “Charged by Belief” marketing campaign, the Curry One was rolled out in mid-February. I was pretty stoked to my hands on a pair and I copped mine the weekend they released. 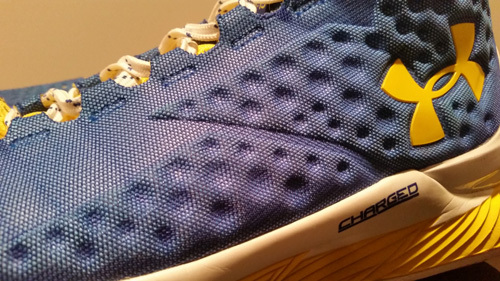 I was expecting a solid, if unspectacular performer, cushioned with “Charged” full-length Micro G foam. 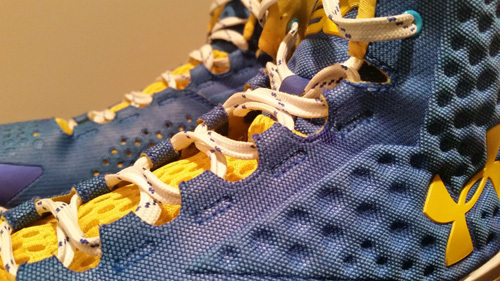 The AnaFoam upper was also something new on a UA shoe, so with a pretty high degree of excitement I laced them up in all three of my leagues the first week. Now a month later, I continue to be blown away. I mentioned the AnaFoam upper already, and it’s been fantastic from a lockdown and comfort standpoint. AnaFoam is built of (obviously) a foam layer but also a stretchy textile that gives it some flexibility and malleability which separates the material from stiffer Fuse uppers that you’d compare it to. I found it to be a very adaptive fit that molds quickly around the foot. There are also perforations throughout the shoe, reducing weight and adding breathability (although I never notice breathability when I’m playing, some may feel differently). Combined with seven lace loops, the fit is vise-like. I loved the way it laced up – no frills and serious lockdown. I had no movement or slippage anywhere inside the shoe, no matter how hard I changed direction or how quickly I’d stop and pop a jumper. The external heel counter is larger and more rigid than the Clutchfit – a definite improvement for me. Fit is the most important aspect of a shoe to me and the Curry One was perfect for all intents and purposes. Supportive, yet flexible and super light (one of the biggest initial impressions of the shoe is how light it plays on-court), UA has something very good going with AnaFoam. Borrowing the outsole tooling from the Clutchfit Drive combined with a Charged Micro G midsole, the transition is buttery smooth. There’s a plastic TPU shank also, not beefy by any means, that adds some support but the shoe flows extremely well from heel to toe. If you’ve read any other reviews on here, you can probably figure out that I love Micro G. It’s the best foam cushioning on the market, period. adidas hasn’t quite dialed Boost in all the way and Lunar foam, in a basketball shoe, is laughably inferior in my opinion. Firm, responsive, consistent and low to the ground, Micro G is everything a foam cushioning platform should be. In the Curry One, the Micro G is “Charged,” which basically amounts to UA adding a layer of the Charged foam on top of the Micro G unit. 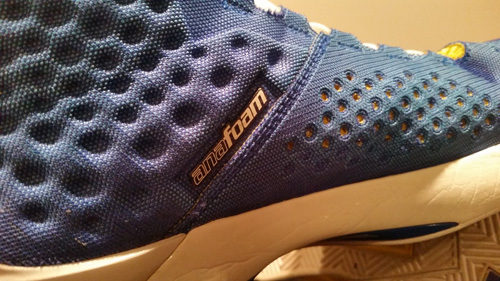 Charged foam is supposed to feel softer under less force (i.e. standing around during a free throw) and then firm up and be super responsive under higher forces. I will say that it does perform as it’s intended to, and while it’s not a drastic difference from pure Micro G, it is better from a firm, responsive standpoint. I already talked about the fantastic transition, but court feel and responsiveness also rate very highly for me. I think it’s better cushioned than the HyperRev 2015, Rose 5 and Clutchfit – and those shoes were all pretty darn good for me too. Full herringbone and the same setup as the Clutchfit Drive. It’s a very good pattern, but the rubber is pretty soft and I’ve found it to be a little slick on less than perfect floors. As long as you keep swiping you won’t have any issues, and on clean floors it’s squeaky good. But most of us probably don’t play on the most pristine court surfaces so it is something to keep in mind. It’s nothing to deter you from buying the shoe, though. Early on you could ding UA for some shoddy craftsmanship, but that’s no longer an issue in my opinion. The last 5 pairs of UAs I’ve had (Spawn 1, Charge Volt Low, Spawn 2, Clutchfit, and now the Curry One) have held up extremely well for me and for the buddies I’ve passed them on to when I’m through with the review. All pairs have taken a beating and responded well. 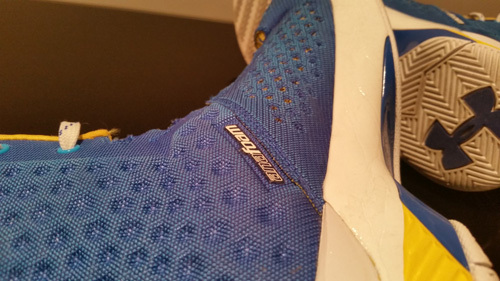 I’m seeing some scuffing and wear on the toecap of the Curry One, but that’s to be expected with any shoe. Other than that, the construction is pretty well done throughout and so far I’ve not had any issues whatsoever. UA did manage to throw in that shiny, plastic-y finish on parts of the midsole that I don’t like aesthetically but it’s nothing to criticize from a performance standpoint. There are also a lot of cool details throughout the shoe and packaging that add to the story and experience with the shoe. You’ll see “4:13” stitched on the tongue in reference to Curry’s favorite Bible verse, Philippians 4:13, and “I can do all things…” shows up on the inside of the tongue. Personally, it’s great to see a brand embrace a player’s faith in that manner. Props to UA and Steph for that one. Inside the box, you’ll find an extra set of laces (I swapped these in immediately) and a card thanking you for purchasing the shoes. The extra attention to detail is something I really enjoyed about the shoe. I typically receive questions about the Curry One at least once a night in the various leagues I’ve played in, and my standard response is this: it is pound for pound the best shoe out there right now. It’s not fancy, not tech’d out, but it’s super light, the fit is incredibly good and cushioning is pretty perfect in all categories. Again, I’m a guard and this is a guard’s shoe, but I think most players would enjoy the shoe regardless of position. At $120 retail, it’s pretty affordable too. You make me want to spend more of my money to get this shoe. I generally prefer low tops but after wearing a higher cut for the first time in a while and doing a lot of running around to catch and shoot, I felt like my feet and ankles were more fresh from wearing the higher cut (Rose 4.5). 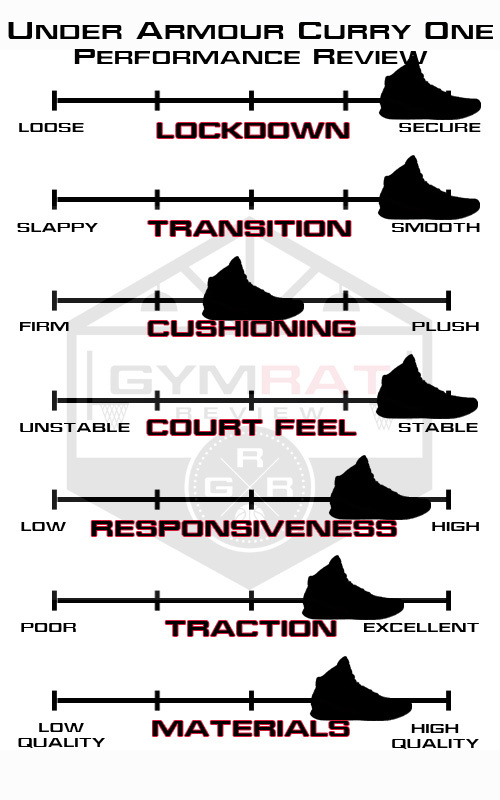 I still want that buttery smooth transition, court feel, and need great traction though because some of the floors that I play on aren’t the best. The Curry One seems to accomplish all of that so it is pretty intriguing. Thanks for the review. Look forward to more in the future. Glad to see this reviewed by you. You seemed to rate it just a slight step higher than most of the other reviews I’ve read in the aggregate. I haven’t heard anything negative at all, I think some people thought with UA’s first sig for Curry that the Charged cushioning would be better than Micro G or something to that effect. I hope UA can continue down their current path of performance basketball shoe development while at the same time keeping prices within reach for the regular hooper. So, would you put this neck and neck with the CFD or better? Yeah I kind of gathered that too when checking out other people’s feedback, but for me the shoe just seemed to fit my style as a player. The goal is to review it objectively with the way I have those sliders laid out, but at the end of the day I just enjoyed playing in it more than other shoes I’ve tested. As far as Charged goes, I could see where some players might not like it as much. It’s definitely more firm, but that’s just what I needed. When it comes to comparing two good pairs of shoes, personal preference is always gonna win out. So for me, the lower cut of the Curry One, slightly firmer cushioning and external heel counter rank it just ahead of the CFD in my book. I never quite got used to the high cut (getting the low would obviously help this) of the CFD, and the soft Micro G is awesome…but I like Charged a hair better. Both shoes are basically even and I’d play in either of em anytime. Now when I compared it to the HyperRev fit/cushioning, the Curry One blew it out of the water. Won’t be going back to the HyperRevs, although I do like the bootie construction. So true about Curry One. Feels like a sock but I wouldn’t go to it as a goto vs Curry One or CFD . seriously the only thing that needs improvement on is the traction. I’ve had the black ice, the spawns, and some team model. All 3 didnt fare too well on the indoor courts i play in. Wished they’d do something abt it. Traction definitely needs improvement. Shoes is awesome but the traction is only decent, at best, on less than perfect courts. Jake, honestly I think the herringbone is really bad. The groves at its peak have a flat surface and the grooves aren’t deep compared to other herringbone traction patterns I’ve tried. Thanks for a great review as always and keep up the great work! I really enjoy your reviews because I feel like they are less biased and the fact that you actually ball in rec league gives me confidence that you push shoes to their limits. I do wish the grooves were deeper, that would be my biggest gripe with the traction. For me, it hasn’t been an issue and I haven’t been slipping around, but it helps to wipe them down a little to keep them clean. I don’t think I’ve been playing on the greatest of surfaces either, and I haven’t had too many problems. 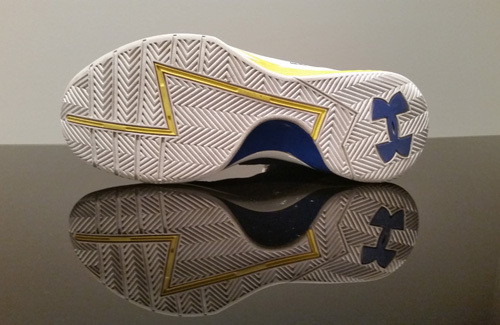 The flexibility of the outsole should help the gripping some too, but it does seem like a lot of UA models (CFD, Curry 1, both Spawn models) could have benefited from deeper grooves. Differing opinions are what reviews are all about though so some people may have had a different experience with it. Appreciate the feedback man, I try to beat each pair up pretty good for a couple of weeks before diving into a review so I’m glad the reviews are working. Reviewing the adidas Crazy 8 beginning tonight as a change of pace from my Curry/Rose combo I’ve been playing in. 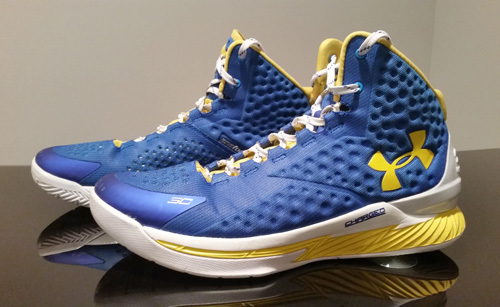 The shoe is great for being its first line with the curry signature. Its weird because the local 24 I play at is horrible but I never had trouble with simple wiping. My current league seems to be kept up better but then I slip often even with wiping haha. Any future prospects on reviews with the melo m11? Yeah I think they’d work, they aren’t extremely narrow. Really good all around shoe, one of my favorites. The shank isn’t extremely pronounced though, and if arch support is a major concern the Spawns would be the move. 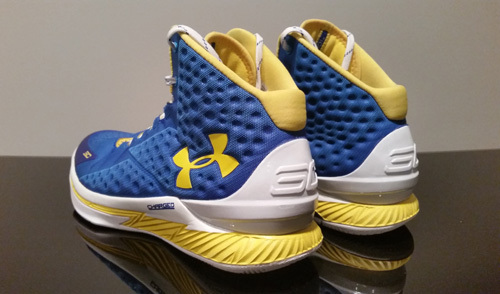 Curry 1 is similar to CFD support wise but cushioning is slightly more firm (and better IMO). Review of the spawn 1 and 2 is on the site as well. To me these could have been one of the best basketball shoes ever, but as it is they are just above average. They should have flipped the two foams with Micro G on top of the Charged foam, giving a plush feel on top of a firm, responsive base. They also should have had a thicker collar with memory foam to improve the support and fit. I love the AnaFoam upper–it gave me flexibility without being loose and more breathability than other UA models–but the lockdown/support were hampered by the fit right at the ankle collar. Those two minor tweaks would have this an out-of-this-world shoe, as it is I thought they were just decent. Also in both pairs I bought to play in, the pivot point right at the ball of my foot was kind of uncomfortable. They had a longer break-in than most UA shoes and that particular spot seemed disproportionately hard even after they were broken in. Maybe it’s encapsulated in some weird way there, I don’t know.